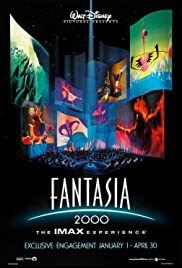 Which Fantasia 2000 Segment Should be a Feature Film? Mickey Mouse: Just wanna offer my congratulations, sir! Mickey Mouse: Aww, gee, thanks! Hehe! Well, I gotta run now! So long! I can't stop watching it!!! Four of the seven new segments in this film are alone well worth the admission. Roy Disney Jr. sets the stage for a remarkable departure from the usual animated dreck that Disney has been bogged down by for the last half-decade (Toy Story aside). Disney have hereby restored my faith in them as leading the pack in animated cinema. I want more!! "Pines of Rome", a marvelous piece set to the "story" of whales leaving the water and eventually the planet, is worth viewing several times for it's symbolism and exquisite look. "Rhapsody in Blue", by Gershwin, is given perfect treatment by a day in the life of New York City. The pace is quick and manages to give each character studied enough depth to make a very satisfying and touching ending. "Pomp and Circumstance", the graduation standard, is humorous and sweet. Creating a love story involving Donald and Daisy Duck into the story of Noah's Ark worked surprisingly well. "Firebird Suite"- WOW. This is the most incredible segment of the film. It's a PERFECT marriage of music and animation and MUST be played loud. Very emotional and powerful indeed. 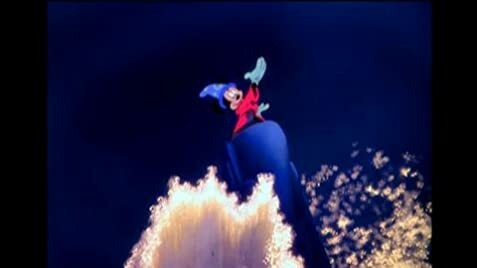 I had to post another comment because I can't stress enough that it's a worthy successor to the original Fantasia, and Walt would be proud.